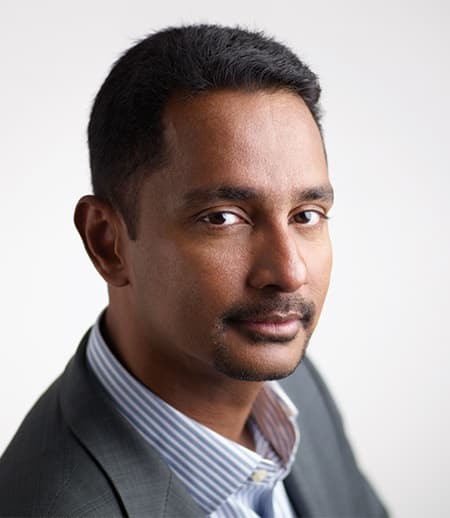 Astrophysicist Ray Jayawardhana became the 22nd dean of Cornell’s College of Arts & Sciences on September 1. As the Harold Tanner Dean of Arts and Sciences, he leads Cornell’s largest college, with nearly 600 tenure-track faculty, 4,000 undergraduates, and 40 departments and programs. This Q&A offers an initial opportunity to learn a little about him as he begins his role. Could you share a few thoughts about your background and interests to help the Cornell community get to know you better? As a child, I was drawn to space because it represented possibility and adventure. Over time that fascination turned into a lasting curiosity about the universe that we inhabit. My father had to drop out of school in seventh grade, when his father died in an accident, but he went on to get a Ph.D. in his late 50s. His love of learning and writing inspires me deeply. As a scientist and a writer, I’ve had the chance to visit places that I could only dream of as a child. Several years ago, I camped out on the Antarctic ice for five-and-half weeks, as part of a meteorite collecting expedition – it was quite an experience for someone who grew up in the tropics. I find it exhilarating to engage with varied perspectives. Once, two English professors and I brought together a poet, a composer, a music critic, an art historian, a particle physicist, a biographer, an architect, a neuroscientist and a pastry chef for a workshop on creativity. It was a blast! Tell us a little about your leadership style. I see my role as supporting and enabling the success of others. To do that effectively, being open, consultative and collaborative is essential. Being genuinely curious and interested helps too. Through conversations in the coming months, I expect to discern and articulate our College’s shared aspirations and emerging opportunities – and empower and support colleagues who will help us reach those aspirations and seize those opportunities. For me, two of the most personally satisfying aspects of serving as an academic leader are recruiting the finest faculty, staff and students and supporting their best efforts; and celebrating and sharing their successes with the broader community of alumni and friends and the world at large. 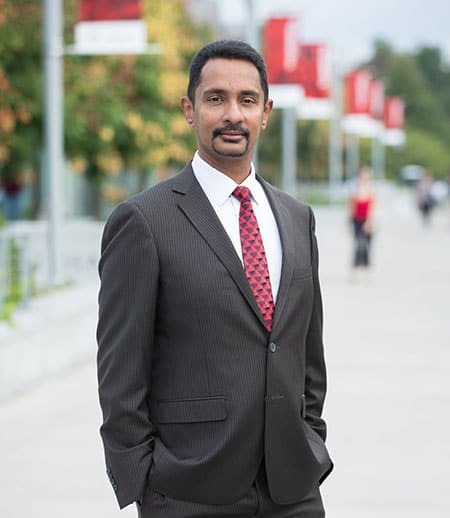 What are you most proud of in your former work as Dean of Science at York University? Where do you see the greatest value in a liberal arts education? At a fundamental level, a liberal arts education encourages us to consider and explore in different ways, through different lenses, what it means to be human. It not only equips us well to take on professional and personal challenges throughout our lives, but also makes our lives more fulfilling and meaningful. The desire to pursue a liberal arts education was a key motivation for my coming to the United States from Sri Lanka, where I grew up. So, serving as the dean of this incredible College of Arts and Sciences is a genuine pleasure and a privilege. You’ve been successful as a researcher. What do you find most compelling about working in administration? Just like in research, academic administration engages and challenges the intellect. You get to collaborate with smart, passionate colleagues to find creative, constructive solutions and pursue shared aspirations. Seeing something go from idea to implementation to impact is immensely satisfying. You’ve published several award-winning popular books on science and spearheaded outreach initiatives throughout your career. Why is this kind of communication important to you? Science, at its best, is a splendid human endeavor, one that enriches us in cultural as well as material ways. So, I think it’s incumbent upon us as scientists, and scholars more generally, to share not only our findings and insights, but also the adventures and challenges of the research process with the public at large. I was inspired by the likes of Carl Sagan and Cyril Ponnamperuma, both compelling communicators in their day, to see broader engagement as an integral part of what we do. More often than not, research papers that I work on tend to focus on specific (some might say narrow) questions and make incremental contributions to advance our knowledge and understanding. Writing for and speaking with the public gives me the opportunity to step back a bit, consider the big picture, and pull a number of threads into a broader narrative. Sometimes that more expansive perspective even helps inform future research directions. Plus, it’s loads of fun to share the ideas and pursuits you’re most passionate about with others. What is your focus in the coming year? I’m very much in ‘listening and learning’ mode right now. My priority is getting to know the remarkable breadth and depth of the College’s activities as well as the amazing people who make up the Cornell community on campus and around the world. My aim is to bolster the core strengths of the College while looking for ways to bring people together for even greater innovation and impact.